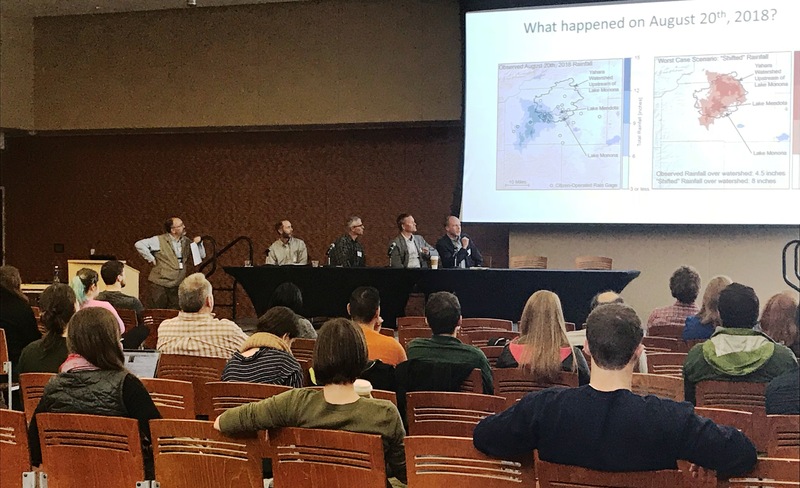 This year we added a few new twists to the Annual Geospatial Summit such as having it in the fall versus the spring; having it in a single room versus breakout rooms; and having an expanded Career Fair session that exceeded our expectations and was a huge success! The Summit was held on in the Symphony Room at the Gordon Commons Event Center on Tuesday, November 6, 2018 with a record-setting 160 registrations! Attendees from various UW System campuses were present and other sectors included various government agencies, private companies, non-profits, the general public, as well as students, faculty, and staff. 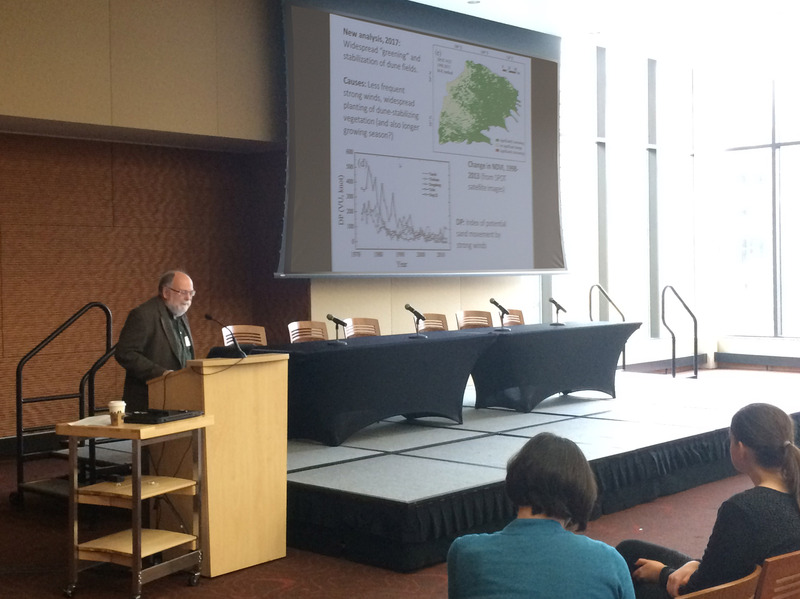 A keynote address by Prof. Joe Mason of the UW-Madison Geography Department, who kicked off the event at 10am, spoke on the recent flooding in Wisconsin and the utilization of LiDAR and other geospatial technology to analyze such events. Following Mason’s keynote, a paper session featuring three speakers from UW-Madison. Prof. Adena Rissman from Forest and Wildlife Ecology discussed her current conservation easement mapping project in the state; Laurel Legenza, Comparative Health Systems Global Pharmacy Fellow in the School of Pharmacy, discussed a project to map and analyze spatial variations of antibiotic resistance across the state; and Jon Lourigan, CAD Manager in Facilities Planning, discussed LiDAR technology to collect data on building interiors. The Career Fair was held from noon to 1:30pm that had 17 representatives from geospatial agencies and companies who talked about what they do and potential opportunities they have to offer to prospective students. 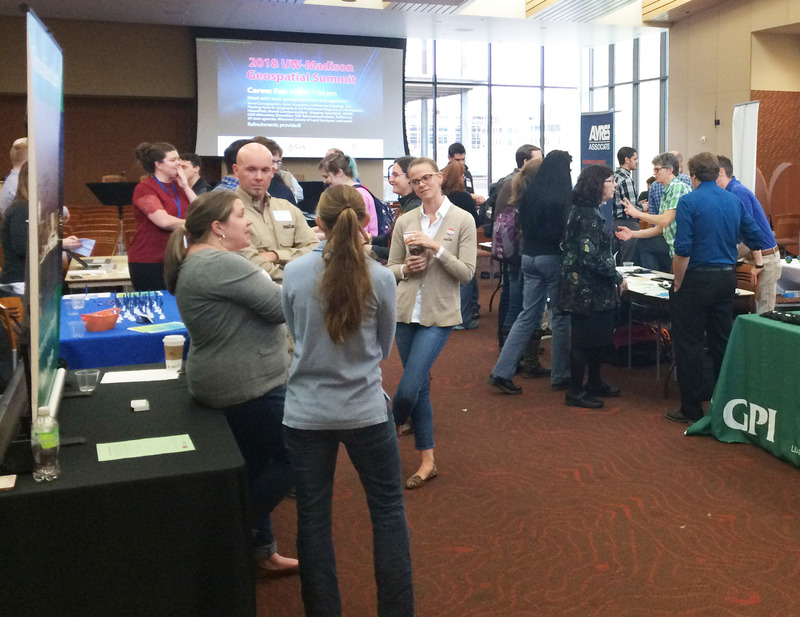 This was well attended and included refreshments sponsored by the GIS Professional Programs at UW-Madison. Feedback from the students and the vendors was extremely positive! At 1:45pm, the afternoon featured a Panel Session focusing on geospatial technology for emergency management, planning and mitigation. The panelists included: Mike Dreischmeier, USDA Natural Resources Conservation Service; Shane Hubbard, Space Science & Engineering Center; Daniel Wright, Civil & Environmental Engineering, and Robert Washbusch, U.S. Geological Survey discussing how geospatial technology can be used to predict and prepare for disasters, as well as disaster monitoring, recovery and resiliency. This session was moderated by Jim Giglierano, Wisconsin’s Geographic Information Officer. 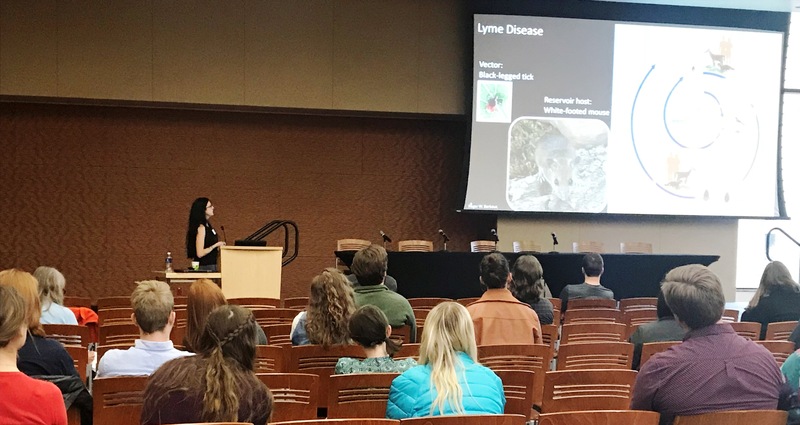 The Summit concluded with a keynote presentation by Prof. Lynnette Dornak, of the Ge ography Department at UW-Platteville, that focused on the impacts of climate change on Lyme disease risk in North America. We want to take this opportunity to thank Joe and Lynnette for being the Keynote Speakers. We also want to thank the Paper Session speakers and the Panel Session speakers along with Jim for moderating, whose time and efforts helped make the event a success. Likewise, we would like to thank the GIS Certificate Program for sponsoring the refreshments. For those of you unable to attend this year, we hope to see you at the 2019 Summit!